The local stock barometer closed above the 8,000 mark for the first time in 10 months on Monday following the prompt resolution of the Resorts World Manila (RWM) rampage alongside investor optimism on the country’s tax reform package. The main-share Philippine Stock Exchange index gained 93.72 points or 1.19 percent to close at 8,001.38, outperforming regional markets which ended with mixed results. The key driver for the PSEi on Monday was that the RWM shooting incident had been solved, said veteran stockbroker Joseph Roxas, president of Eagle Equities. Police authorities identified the gunman who set RWM’s gaming area on fire on Friday as Jessie Carlos, a former Department of Finance employee who was having financial problems and was addicted to gambling. “Market is really strong. There was just a speed bump on Friday because of the RWM incident,” Roxas said. Investors took comfort from all indications that the RWM incident was not a terrorist attack despite ISIS’ claim that it was behind this rampage. The PSEi closed above 8,000 for the first time since Aug. 10, 2016. It is now a little over a hundred points away from the market’s all time high closing of 8,127.48 on April 10, 2015. Roxas said optimism on the tax reform program, foreign fund inflows and some seasonal buying were driving the local market higher. With the start of the second semester of the year, some investors are building up their equities position. “The market’s breach of the 8,000 level can be attributed to the optimism over the developments in the Department of Finance’s Comprehensive Tax Reform Program (CTRP),” said PSE president Ramon Monzon. President Rodrigo Duterte has certified to Congress the urgency of the CTRP and the House of Representatives promptly passed the same before its adjournment. It has been reported that the tax reform package is estimated to generate additional revenues of P130 billion for the government on the first year of its implementation. 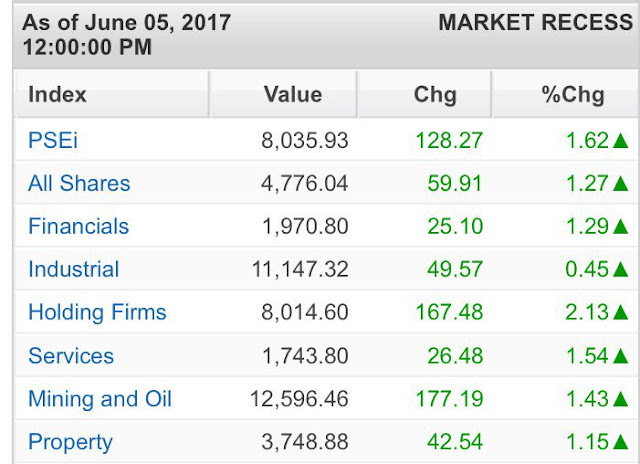 Year-to-date, the PSEi has gained 17 percent. “Philippine markets touched another milestone as the index closed at a new year-to-date high and settled at the 8,000 level for the first time this year. Sentiment from Friday was carried over after U.S. equities rose to record levels on Friday as Wall Street shrugged off a jobs report that came in well below expectations,” said Luis Gerardo Limlingan, managing director at Regina Capital Development. At the local market, all counters ended higher led by the financial, holding firm, services and mining/oil counters which all advanced by over 1 percent. Total value turnover for the day amounted to P8.65 billion. There were 116 advancers that edged out 80 decliners while 43 stocks were unchanged. Metrobank led the PSEi higher with its 5.29-percent gain. SM Investments, SM Prime, PLDT, GT Capital, DMCI and BPI all climbed by over 1 percent while URC, ICTSI, BDO, AGI, Jollibee, Globe and Ayala also firmed up. Outside of the PSEi, notable gainers included Cirtek Holdings, the most actively traded company. Its share price rose by 0.86 percent after its wholly owned subsidiary Cirtek Electronics Corp. announced that it’s divesting 24 million shares in Cirtek at P23.20 per share. Several gaming stocks also rebounded following the resolution of the RWM incident. Bloomberry and Melco Resorts both gained over 3 percent on Monday. RWM owner Travellers, however, was still down by 0.96 percent as the company has suspended gaming operations since Friday’s incident which had killed at least 37 people. Another notable gainer was newly listed Eagle Cement Corp. which gained 1.01 percent in heavy volume. On the other hand, ALI fell by 0.97 percent.